Watching favorite videos in iPhone iPad will be an extremely cool thing for Apple fans. But if these videos are stored on computer, you have to transfer video into iPhone iPad with iTunes. It will be much worse if the videos or movies are not Apple-approved videos (MP4, MOV, M4V), you need to spend hours to convert videos to correct formats, then sync to iPhone or iPad. Right now download Air Playit, you'll never be frustrated by the tedious conversion and tough sync. It can help you remotely watch videos stored on your computer anywhere, like at the airport, in the shop, KFC, etc. Air Playit is powerful &free video audio steaming software for iPhone iPad which works perfectly in streaming & downloading video audio to iPhone iPad via WiFi, 3G, 4G networks. Built in 320 video audio codecs, Air Playit can support streaming and live converting almost all movies and music. Thus, you can instantly play these movies music without third-party video converter and iTunes. It is available for both Mac and Windows users. Air Playit is made up of two parts, Air Playit Server and App Client. Now let's go to see how this video audio streaming software works. 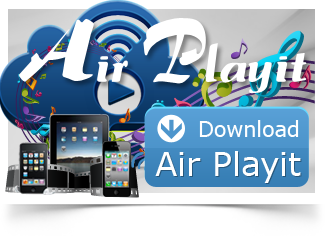 Launch Air Playit Server after downloading & installing on your PC or Mac. 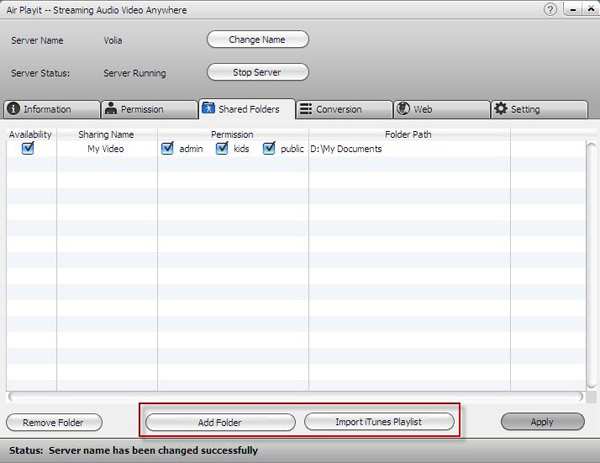 This server is mainly for you to add video audio from folders or iTunes Playlist to "Shared Folder", live & offline "Conversion" and video streaming. There are also some practical features, such as "Web" that will allow you access audio video added in shared folder via web brewers, "Permission" lets you set the PIN of Admin, Kid and Public. And from the main interface, you can define "Server Name" as you like and also change name. This server will automatically discover the IP address and Port and show in the "Information" table. Download, install and run App Client on iPhone iPad. This app is mainly used for remotely playing and watching audio video on iPhone iPad. Firstly, you need to add the server. Then browse the folder under the server, choose the video or music you want to enjoy by clicking "Play" to stream and play on iPhone. Surprisingly, played music will automatically download to iDevice without sync. Plus, you may download beloved video to iDevices. PS: Client app can automatically discover the local server by Bonjour Server. If sometimes the Bonjour connection information can not be found by the client app, you need to specify the server address manually by filling the IP Address, Port, PIN, etc. Take the following pictures for example. 5. Streaming and automatically download music audio to iDevice, so that users can play it anywhere even no network connection. 9. Automatically list the recent played video and remember the last play point for each. Want to endure the bound of iTunes anymore? 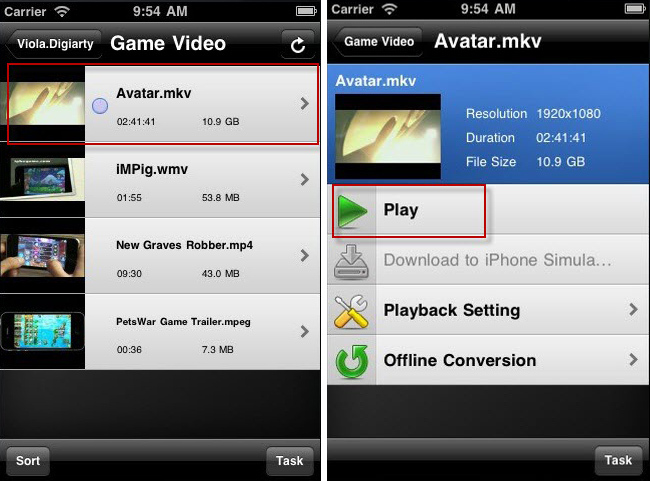 Escape from the video converter meanwhile play videos of any format on your iPhone. 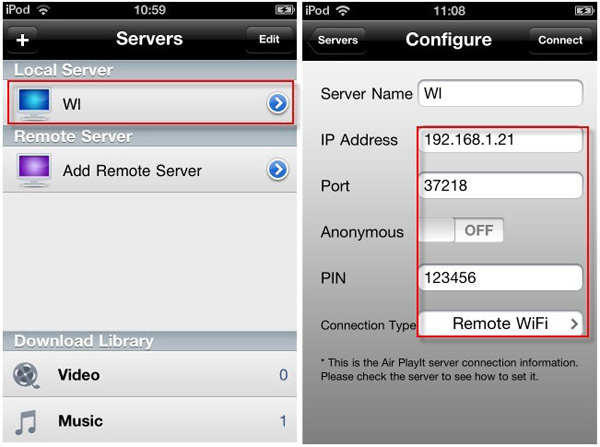 With Air Playit, now you can remote convert and streaming video to iPhone iPad.